A 53-year-old woman diagnosed with ovarian cancer was transferred to the ICU requiring mechanical ventilation and pressure support. In the 2 days prior to admission she experienced nausea and vomiting that started soon after the placement of a chest wall port catheter with a baseline platelet count of 338,000 /mm3 (Figure 1). After a complicated clinical course which required heparin drip for myocardial infarction, the patient experienced upper GI bleeding and a cold left foot with absent pulse in the dorsalis pedis artery. On day 9 from initial exposure to heparin, clinical suspicion of heparin-induced thrombocytopenia with thrombosis (HITT) led to evaluation with HIT antibodies which were confirmed days later by an enzyme-linked immunosorbent assay (ELISA). Cross-sectional imaging (Figures 2 and 3) performed on days 10 and 11 demonstrated evidence of wide spread thrombosis. On day 11, argatroban was initiated in lieu of heparin, however, the patient died on day 14 from initial exposure to heparin. 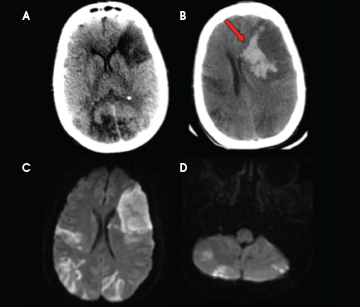 An unenhanced head CT obtained on day 10 from initial exposure to heparin for persistent altered mental status demonstrated multifocal, wedge-shaped hypodensities involving both grey and white matter in keeping with ischemic stroke which was later corroborated with MRI (Figure 2). DWI MR images showed restricted diffusion in the corresponding hypodense regions on CT as well as additional stroke burden involving the posterior circulation (Figure 2). 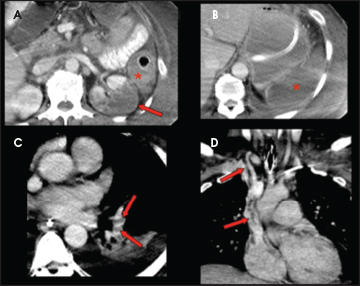 Hemorrhagic conversion was demonstrated in Figure 2B obtained as an unenhanced CT 2 days after the initial head CT.
On day 11 from initial exposure to heparin, a contrast-enhanced CT of the chest, abdomen and pelvis was performed (Figure 3) and demonstrated thrombosis within the right internal jugular vein with extension into the superior vena cava and right atrium. Additionally, bilateral pulmonary emboli and extensive solid organ infarction affecting the spleen and kidneys in addition to colonic ischemia were also demonstrated (Figure 3). The clinical diagnosis of HITT should be suspected in anyone with thrombocytopenia that is time-concordant with exposure to heparin and has evidence of end-organ dysfunction. Early diagnosis is imperative since this antibody-mediated drug reaction is associated with high morbidity and mortality and because one of the cornerstones of treatment involves immediate discontinuation of the offending drug. Thus, a high clinical suspicion is essential for establishing a prompt diagnosis. Even though the imaging findings of HITT are nonspecific, given the widespread use of noninvasive imaging techniques to evaluate medically complex patients, the radiologist should consider this infrequent entity in the setting of widespread end-organ infarction, especially when both arterial and venous thrombosis are present. By recognizing these findings the radiologist may be the first in suspecting HITT and should recommend correlation with platelet count and, if clinically warranted, HIT antibodies. Disclaimer: The opinions and assertions contained herein are the private views of the authors and are not to be construed as official nor as representing the views of the Departments of the Army, Navy, Air Force, or Defense. Murphy KD, Galla DH, Vaughn CJ, et al. Heparin-Induced Thrombocytopenia and Thrombosis Syndrome. Radiographics. 1998;18:111-120. Arepally GM, Ortel TL. Heparin-Induced Thrombocytopenia. N Engl J Med. 2006;355:809-817. Silver D, Kapsch DN, Tsoi EKM. Heparin-Induced Thrombocytopenia, Thrombosis, and Hemorrhage. Ann Surg. 1983;198:301-305. Rhodes GR, Dixon RH, Silver D. Heparin Induced Thrombocytopenia: Eight Cases with Thrombotic-Hemorrhagic Complications. Ann Surg. 1977;186: 752-758. Kato S, Takahashi K, Ayabe K, et al. 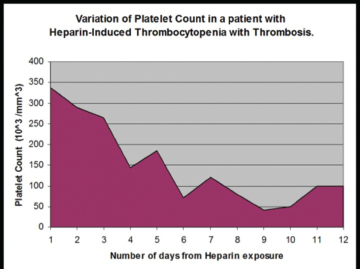 Heparin-induced thrombocytopenia: analysis of risk factors in medical inpatients. Br J Haematol. 2011;154: 373-377. Greinacher A, Farner B, Kroll H, et al. Clinical features of heparin-induced thrombocytopenia including risk factors for thrombosis. A retrospective analysis of 408 patients. Thromb Haemost. 2005;94:132-135. Sekhon SS, Roy V. Thrombocytopenia in Adults: A Practical Approach to Evaluation and Management. Southern Medical Journal. 2006;99:491-497. Lindsey SM, Maddison FE, Towne JB. Heparin-Induced Thromboembolism: Angiographic Features. Radiology. 1979;131:771-774. Lammering JC, Wang DS, Shin LK. Heparin-induced thrombocytopenia (HIT) causing portosplenic, superior mesenteric, and splenic vein thrombosis resulting in splenic rupture and pulmonary emboli formation. Clin Imaging. 2012;36(6):865-868. Linkins LA, Dans AL, Moores LK, et al. Treatment and Prevention of Heparin-Induced Thrombocytopenia: Antithrombotic Therapy and Prevention of Thrombosis, 9th ed: American College of Chest Physicians Evidence-Based Clincal Practice Guidelines. Chest. 2012;141:495-530. Radiological Case: Imaging findings on heparin-induced thrombocytopenia with thrombosis. Appl Radiol. Prepared by Dr. Rohena-Quinquilla and Dr. Baird while at Walter Reed National Military Medical Center, Bethesda, MD.